The big news is that Kim Stanley Robinson's latest novel, 2312, has won the Nebula Award for Best Novel! This is Robinson's first Nebula win after Red Mars! At the same ceremony, Gene Wolfe was the recipient of the 2012 Damon Knight Memorial Grand Master Award, and appropriately enough Stan's acceptance speech was centered on congratulating Wolfe as well! As covered earlier, there are more awards ceremonies coming in the rest of the year! This is no longer 2012 and the 'exactly 300 years in the future' setting no longer works, but 2312 is still a new novel -- I've even seen typos from readers mentioning it as 2313! 2312 has also just been released in mass market paperback in the UK and as far as I can tell the USA as well (June 25 2013) by Orbit. It has also just been published in Spanish, for Spain and the whole of Latin America (June 18 2013) by Minotauro. Sword and Laser interviewed Stan at the SFWA Nebulas event, actually a few hours before what proved to be a win! 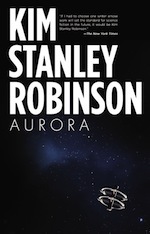 Stan speaks about a lot of his novels, not just 2312 and the Mars trilogy, and in the middle of the SFWA Nebulas Weekend there are a lot of laughs to be had (direct mp3 download). Many problems in travel around the solar system were solved when asteroids were adapted to the task. Thousands of ovoid asteroids were hollowed out so that their insides were empty cylinders, and then they were set spinning on their long axes to create a gravity effect inside. Crews and passengers live at one g, well protected from cosmic radiation, and move in orbits around the solar system like giant ocean liners. They never slow down, and catching up to one in a little ferry can be a crushing experience, as your reporter recently learned. Each asteroid contains a particular biome, filled with the plants and animals from particular landscapes back on Earth. Some are more aquarium than terrarium. If species have been mixed to make a mongrel biome, as has happened on Earth since the first living creatures migrated from one ecosystem to another, the result is called an Ascension, after Ascension Island in the South Atlantic. The island was bare rock until HMS Beagle landed there, and Darwin himself planted a variety of plants which have since prospered. By a nice coincidence, your reporter’s recent voyage was on the Wegener, an Ascension asteroid composed of plants and animals from West Africa and eastern Brazil. It is a beautiful space, highly recommended, but all the terraria are gorgeous in their own ways—in effect, floating works of landscape art. Take a trip on one and see! I had recently written an introduction to John Brunner’s excellent Stand On Zanzibar, which had solved a similar problem by using the method invented by John Dos Passos in his great U.S.A. trilogy. [...] So, I adapted all the strands to my own purposes. My main strand follows my characters Swan and Wahram and Genette. The newspaper columns I turned into extracts from all kinds of unidentified texts, and I cut all these texts into minimal pieces to imitate how we read online, linking from one source to the next as we pursue the information we want. The biographies of famous people I had to alter somehow, because I don’t think pocket biographies of fictional people can be as interesting as the same for real people; so I had my biographies be of moons and planets and big spaceships, as these were in effect historical actors in my story. Then lastly I made the camera eye strand be the stream of consciousness of a quantum computer, put in an android body and let loose in the world for the first time. Stranger Than Fiction, a podcast from Slate, the New America Foundation, and Arizona State University, has interviewed Robinson about the politics of science fiction, how robots have historically represented wage workers, and why we need to right Earth before we head to Mars: "Mars is a good 23rd-century project" (direct link to SoundCloud). Capitalism is a system of power and ownership that privileges a few in a hierarchical way, and it has in it no good controls or regulation concerning its damage to the biosphere, so to deal with the environmental catastrophes bearing down on us, we have to impose our will as a civilization on capitalism and make it do what we want civilization to do now, which is to create a just and sustainable human interaction with the biosphere and each other. [...] So it is tricky work. But I am saying that democracy and science are stronger than capitalism. It is an assertion we are going to have to test to see if it is true or not. It will be a fight. It is the fight of the 21st century like the fight against totalitarianism was the fight of the 20th century. Indeed we did not definitively win that fight, because capitalism is a new kind of totalitarian system, fully capable of buying up democracy and science, and trying now to do so. So it is a tricky fight, but necessary work for us all. A video of the Humanity+ conference from last December found its way to YouTube. Watch Stan argue for "Humanity minus" in front of a crowd veering more towards transhumanism and the high-tech cyborg. Video of the Drummond reading. Video of Stan on the idea of living on Mars. Some additional reviews for 2312 are still popping up: Breaking It All Down (video); Dark Matter; TPI's Reading Diary; and an article on reviews bias by the Economist. Most notably, Kim Stanley Robinson participated in the publication by the Worldwatch Institute's "State of the World 2013: Is Sustainability Still Possible?" The Worldwatch Institute is a research institute/think tank: "Through research and outreach that inspire action, the Worldwatch Institute works to accelerate the transition to a sustainable world that meets human needs. The Institute’s top mission objectives are universal access to renewable energy and nutritious food, expansion of environmentally sound jobs and development, transformation of cultures from consumerism to sustainability, and an early end to population growth through healthy and intentional childbearing." The first section, The Sustainability Metric, explores what a rigorous definition of sustainability would entail, helping to make this critical concept measurable and hence meaningful. [...] The second section of the book, Getting to True Sustainability, explores the implications of the gaps that remain between present realities and a truly sustainable future. [...] And so the book’s third section—Open in Case of Emergency—takes on a topic that most discussions of sustainability leave unsaid: whether and how to prepare for the possibility of a catastrophic global environmental disruption. Stan contributed with a chapter of his own: "Is it too late?" The book and its concepts were presented on several occasions in the USA and Europe. On April 16, there was a State of the World 2013 Launch and Symposium at Washington DC, with panels by: “Beyond Sustainababble” by Worldwatch President Robert Engelman, Panel on “Getting to True Sustainability,” Panel on “Getting Through the Long Emergency,” Keynote by science fiction author Kim Stanley Robinson, and Closing Reflections by Town Creek Foundation Executive Director Stuart Clarke. The whole can be seen as a playlist on YouTube (Robinson's video only). The authors also spoke shortly one-on-one videos (playlist; Robinson). No. It is not yet too late. It is physically possible to shift infrastructures, technological arrays and social systems in ways that would make them so much cleaner than what exists now, especially in carbon terms, that extinctions would not soar, food shortages would not occur, and 7 billion or even 9 billion humans could share the planet with other living creatures in a healthy way. But that's not easy to do. We will do some things wrong. There will be human suffering, there will be suffering among the other creatures on Earth. There will be extinctions. We are going to do damage in the 21st century, possibly big damage. And unfortunately, unlike Wile E. Coyote, we won't get infinite chances to fall and try again. So the question should be changed from the disempowering question, "Is it too late?" to, "How much damage will we let happen?" Then we could flip that revised question to its positive formulation: "How much will we save? How much of the biosphere will we save?" That's the real question. Robinson also recently spoke to students of Davis High School -- funny to read him described as "local science fiction author", KSR right down the street!